A few minutes after writing this post about the commencement of my 1,800 mile journey to Moab, my 1948 Willys CJ-2A Jeep broke down. Ten miles from my house. After some final goodbyes from my friends during breakfast, I pulled out of the diner and headed down Big Beaver Road westward out of Troy, Michigan. With the trusty, war-tested Go-Devil engine purring away under hood, and the freshly rebuilt T90 trans shifting Fonzie-smooth, I was feeling confident. But that confidence was shattered after just a few miles, as the Jeep began bucking, with the engine making power in abrupt spurts that nearly made me soil my pants on the busy suburban road. 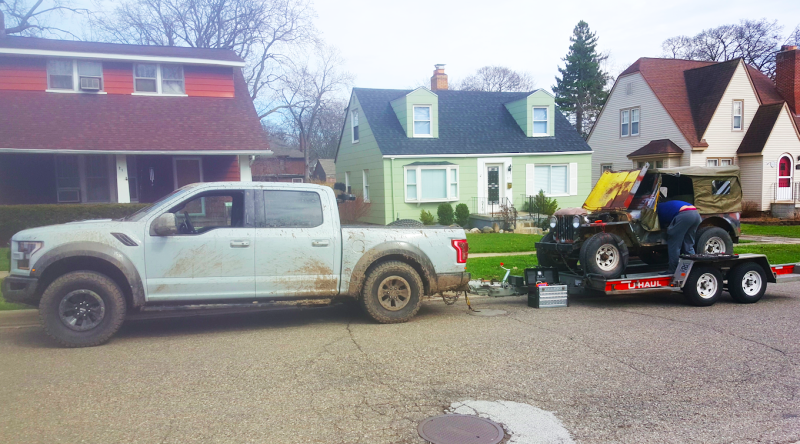 I pulled over in a fancy neighborhood filled with Bloomfield Hills Mansions, and Freddy—who was tailing me in a new Ford Raptor—joined me on the roadside to have a peek at the engine bay. The carburetor was spewing fuel. Unsure what the issue was, I called up my good friend Brandon (a brilliant Willys mastermind), who told me to bring the car by his house, which was only a few miles away. Freddy and I tried pushing the little Jeep up our trailer, only to get it 99 percent of the way up, but still not quite where it needed to be. We tried pushing it more, but she wouldn’t budge. So, to get the Jeep the other one percent, I decided to use an old off-road trick: put the car in low range, drop her into first, and let the starter move the car forward. With the CJ-2a’s torque and 5.38 axle ratios, even that six volt starter should suffice. But I stepped on the starter switch and smoke billowed from under my dash, filling the interior. The starter switch was toast. Discouraged but desperate for time, Freddy and I rolled the Jeep back off the trailer, and this time gave her a big run up before shoving the Willys successfully up the ramps. I called my friend Bob (who made my awesome top), and he told me to look into the fuel pump. Sadly, the local car parts store could only get a 1948 Willys CJ-2A pump the following day, so Freddy and I headed back to my house and got a good night’s sleep. As I cruised down Woodward at 40 mph, the engine suddenly cut out. There was no sputtering or lurching—just boom: no power. Seemed like an electrical fault to me, and my friend Brandon agreed, recommending that I look into the ignition switch. After about 60 miles of torture testing, the Jeep seems buttoned down, finally. And on Tuesday, we try leaving Michigan one more time. I wonder how far we’ll make it this time. Anything over 10 miles would be progress. Please make it more than ten miles. Please please please please please please please.